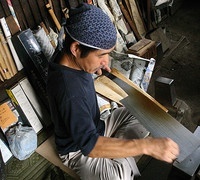 The Japanese pull saw, or nokogiri, consists of a steel blade (nokomi) and a wooden handle (e). The teeth of the blade are called noko-ba or noko-me and the opposite side without the teeth is called se. The part of the blade closer to the handle is called motomi or honmi while the end of the blade is called suemi. 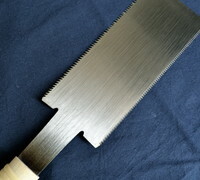 Generally, the blade is thicker in cross-section in the middle and has a wide and thin suemi which gradually become thicker and narrower towards the motomi. This structure allows the blade to evenly spread the physical pressure exerted on it. 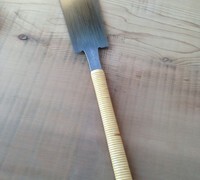 Japanese nokogiris are unique in that they are designed to cut during the pull stroke in contrast to the design adopted by the great majority of saws around the world that cut during the push stroke. The two major categories of nokogiri are the ripsaw (tatebiki-noko) which cuts along the wood grain, and the crosscut saw (yokobiki-noko) which cuts across the wood grain. 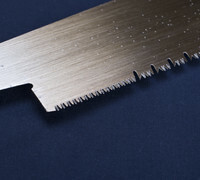 There is also a widely used nokogiri known as ryoba-noko which began to be used around the end of the 19th century, and has both ripsaw and crosscut saw teeth placed on opposite sides of the blade. Please feel free to browse through our selection of fine nokogiri, and please, contact us if you have any further questions.